Designed to comply with the latest PCI specifications, the Fastcom: FSCC-232 Universal PCI (PCI version 2.3) adapter will operate in both 5V and 3.3V PCI slots. This means the card will work in the high speed PCI-X slots commonly found in most new servers, as well as the standard PCI slots in desktop PC’s. This flexibility allows for a single serial interface board to be used across a wide range of different types of computers including both current and future computing systems. The Fastcom: FSCC-232 adapter is the one of the most advanced synchronous communications adapters in the industry. The Fastcom: FSCC-232 supports data rates up to 1 Mbit/s. The Fastcom: FSCC-232 is a dual channel adapter, with each one being individually configurable to use HDLC/SDLC, ASYNC (using 16C950 UARTS), or Fastcom®: X-Sync protocols. Although similar to the ESCC and SuperFastcom families of adapters, the FSCC-232 expands on our previous adapters. The most notable expansion is the longevity of the components of the board. Faced with the inevitability of obsolescence, Commtech decided to put an end to the lifespan problems that plague most computing customers. We designed a serial communications controller with our customers’ needs in mind, and built a card around it. Wholly designed and owned by Commtech, Inc, this FPGA based SCC has most of the features that you are used to seeing in a quality Fastcom product. It also includes a few new features that come directly from customer requests. If the existing FPGA technology is ever discontinued by the chip manufacturer, the design can simply be re-targeted to the next generation of FPGA chip with no impact on compatibility. BAUD RANGE: Using the user independent programmable clock generator in conjunction with the baud rate register, virtually any baud rate from 1 bps to 1 Mbit/s can be attained. 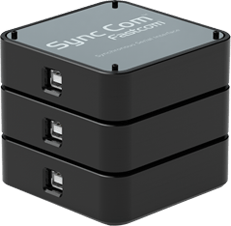 Customizable Firmware: The firmware for our FSCC and SuperFSCC product lines is fully-customizable. If you have a feature requirement you do not see listed, please contact us about modifying our firmware to meet your specific needs. True-Async mode. Each port can be set to use the on-board 16C950 UARTs and can be used as a standard serial (COM) port. Transmit and Receive status LED’s for each port. The FSCC and SuperFSCC families of cards fully supports the HDLC framing convention. It does not support automatically decoding of the SDLC control fields. If control bytes are present in received frames they will be passed to the user as if they were part of the info field. If control bytes are required to be transmitted they will have to be generated by the user and written as if they were data. Shared flag mode: opening flag and closing flag of back-to-back frames can use the same flag. These data rates are the maximum guaranteed rates. While it is possible to clock the 232 transceiver chips at faster speeds, they are greatly affected by a number of different factors. See the Baud Rates section of the manual for more details. Click here for Fastcom: FSCC-232 drivers. Click here for the Fastcom: FSCC-232 product manual.